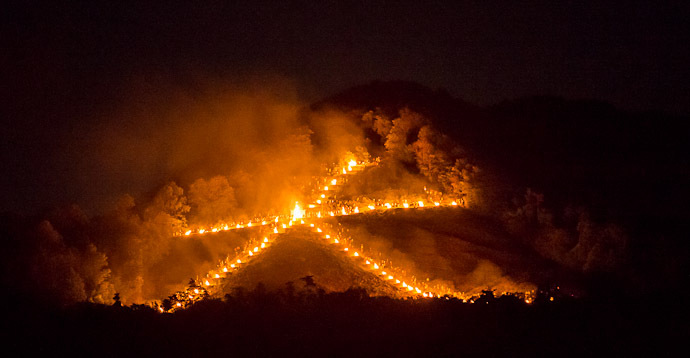 Today was the Daimonji Festival in Kyoto, where big mountainside bonfires are lit in the evening. Normally I'm visiting my folks during the summer, so this was the first time in years for me to see it, and the first time since I became particularly interested in photography. The snapshot above was done handheld with little forethought; with a bit more effort I'm sure I could have gotten something more worthy, but frankly, if given the chance again I would leave the camera at home and concentrate on what appears to be the more festive aspect of the festival: enjoying a drink and good company under the stars. Update: it seems I'm wrong about the lack of photogenic possabilities: see the followup at “Daimonji Fire Festival Up Close and Personal: Yaron Silberberg’s Photos from Last Year”.